Capital Community College’s Changing Lives Gala, postponed in early November because of the late October storm and power outages, will be held Wednesday, December 14 from 5:30 to 8:30 p.m. at the 950 Main Street campus in the college’s historic art-deco auditorium, Centinel Hill Hall. Focusing on Capital’s mission through the experiences of successful students, the annual charity event will include a silent auction and a live auction where attendees can purchase “credit courses” for students. The evening will include dinner, complimentary wine and beverages and music. The award-winning Alturas Duo, a Hartford-based ensemble, will perform. The Duo’s Carlos Boltes and Scott Hill have been recognized as one of the most engaging ensembles performing in the chamber music world today. 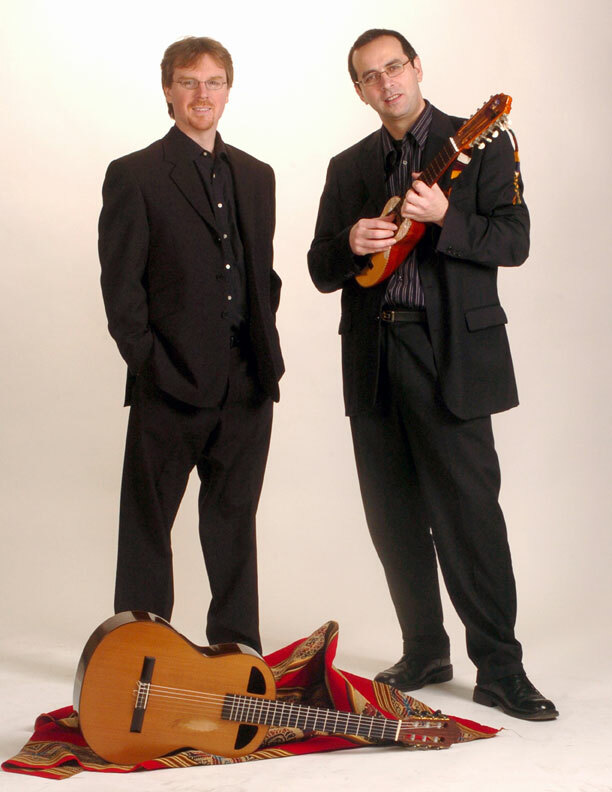 The only group of its kind, the Duo was formed with the idea of playing South American and classical music by bringing together the unusual combination of the viola, charango and guitar, and in doing so, creating passionate music that moves at ease between the Baroque, South American folk rhythms and new pieces written especially for the Duo. The Duo has performed in Brazil, Canada, Chile, Bolivia, throughout the US and Puerto Rico including recitals at: Carnegie Hall, Merkin Hall, the Smithsonian Institute, the Music Mountain Chamber Music Series, La Guitarra California, and the 34th International Viola Congress. The name Alturas (Spanish for heights) is derived from the poem “Alturas de Macchu Picchu” by Chilean poet, Pablo Neruda. The Alturas Duo, an award-winning ensemble, known ofr playing "passionate music" between the Baroque and South American folk rhythms. Travelers Insurance Companies is sponsoring the Changing Lives Gala and will be recognized for five years of partnering with the college to establish the Crossroads to Careers Program (C3) supported by Travelers EDGE initiative (Empowering Dreams for Graduation and Employment). The Crossroads program has provided students with financial support, internships, mentoring, advising, and leadership development in the workplace. The program has engaged 35 students since its inception and the Travelers’ EDGE initiative involves Central Connecticut State University and the University of Connecticut where Capital C3 graduates have transferred to earn the baccalaureate degree. Reservations are available for the Changing Lives event at $100 per person ($50 for alumni and students). For more information or reservations contact Leticia Colon at (860) 906-5244 or e-mail CA-foundation@ccc.commnet.edu. Aside | This entry was posted in Alumni, Crossroads To Careers, Events. Bookmark the permalink.